The Lesnett family came from Germany. According to family tradition, Christian Lesnett came to America in 1752. The name is spelled a variety of ways but the usual spelling in the early days was Lisnett. It later became Lesnett. Points of interest: Christian Lesnett served on Col. Henry Bouquet’s expedition to Fort Pitt during the Indian War known as Pontiac’s Conspiracy and later served in the militia during the Revolutionary War; Dell Lesnett served in the Union Army during the Civil War. Francis, also known as Frank, born Nov. 13, 1759. Sophia, born 1762. Married William Rowley. Margaret, born 1767. Married Richard Boyce. Christianna, born March 13, 1771. Married John Neal. An unusually large number of stories have come down to us concerning the early members of the Lesnett family. Family members provided important information in an 1889 history of Allegheny County, an account of a 1912 family reunion and the book “Christian Lesnett Genealogy,” by Daniel M. Bennett, which was published in 1931. All three items might trace their information back to a single original source; however, it seems likely that they represent two similar, but difference traditions. These three sources agree on the major points of the family’s history, but conflict on several details, as I indicate in the footnotes. It appears very likely that the basic information is reliable. The longevity of people with good memories may have played a role in the survival of this information. The account of the 1912 reunion mentions that one member of the family had lived to the age of 104, which would have provided a solid link to the era of Christian Lesnett, who died in 1807. In addition, the 1931 genealogy mentions people who remembered Christian’s eldest son Frederick, who died in 1830. Christian Lesnett immigrated to America in 1752, according to the Lesnett genealogy. As was the case with many Germans, his name probably was anglicized. It appears in a variety of ways, including: Lisnett, Listnet and Lesneet. Whether any of these represents the original German spelling is unknown. The colonists landed in Baltimore and moved west to Frederick, Md., where they settled, according to family tradition. According to family tradition, Christian was a cabinetmaker and had a shop in Frederick. But after a few years, the shop burned down and the Lesnetts moved northwest to Hagerstown. It should be noted that extensive searches of records from the Frederick and Hagerstown areas have failed to turn up any reference to the Lesnett family. In addition, several important details of this account conflict with statements made in Francis Lesnett’s application for a Revolutionary War pension. That document states that Francis was born in 1759 in Pittsburgh. If that’s so, it raises questions about much of the following account. Although the French and Indian War was over, hostilities still flared up at times. In 1763, Pontiac, an Ottowa chief, organized a series of surprise attacks at strategic points from Detroit to Fort Pitt, the present site of Pittsburgh. The English sent a relief force under Col. Henry Bouquet to western Pennsylvania. The force included some rangers from Maryland but was primarily made up of British regulars, many of whom were recruited in the American colonies. (5) Christian joined this force and was assigned to help repair and defend the wagons, according to the Lesnett genealogy. The force traveled along the Forbes Road until Aug. 5, when it was attacked by Native Americans at Bushy Run, about 25 miles southeast of Pittsburgh. The British forces held off several attacks on the first day. On the second day, Col. Bouquet’s men faked a retreat and drew the Indians into a trap. The Native Americans were decimated and the soldiers made it safely to Fort Pitt. While the little army was stationed at Fort Pitt, Christian saw the possibilities of the country. After a peace treaty was signed in 1768, he took the first opportunity to settle there. When Christian returned to western Pennsylvania in 1769, he brought his two oldest sons – Frederick and Frank – and a man named Gillion, or Richard Gilson. (6) They cleared the land, built a cabin and planted rye, turnips and corn. In the fall, the men returned to Maryland to gather their families. However, Christian was detained as a witness in a lawsuit and they were unable to travel to western Pennsylvania until the following spring. The boys stayed on the homestead that winter. The area in which Christian settled later became South Fayette Township in Allegheny County. “A Genealogical and Biographical History of Allegheny County, Pa.,” published in 1889, credits him with being the township’s first permanent white settler. “History of Allegheny County, Pennsylvania,” published in 1876, agrees and says, “He emigrated from Germany to Baltimore, Maryland, and came from there to South Fayette before 1770.” (12) The Lesnetts appear in the records of several Pennsylvania counties because of changing boundaries. Their property fell within the boundaries of Washington County when it was formed in 1781 and within the boundaries of Allegheny County when it was formed in 1789. The service in Swearingen’s ranger unit included extensive campaigning following Indians raids that swept across much of western Pennsylvania. (18) Rangers were generally skilled woodsmen and fighters who patrolled the frontiers, searching for Native American raiding parties. In 1790, Christian Lesnett appear in the census under Allegheny County. His household contained four males age 16 and older, one male younger than 16 and two females. Soon after this, farmers in western Pennsylvania protested taxes on whiskey, which was a primary source of income for the pioneers. Whiskey – distilled from the grain grown by western farmers – was easily transported to eastern markets. The most dramatic encounter of the Whiskey Insurrection was on July 15, 1794, when rebels burned some buildings at the farm of the man responsible for collecting the tax, Gen. John Neville, who lived near the Lesnetts. According to the Lesnett genealogy, a group of rebels passed the field the Lesnetts were working and asked them to join. The Lesnetts replied that Neville was a neighbor and they didn’t want to get into a squabble that might make things unpleasant. Christian appears to have remained relatively prosperous into later life. His estate inventory lists 32 notes for loans to family and neighbors. They total about 455 (it’s hard to say whether this amount is in pounds or dollars but pounds are the denomination used in his will). Christian died in 1807, before Oct. 10, when his will was proved. (23) Christianna died in 1813. They are said to be buried in St. Luke’s Cemetery, Woodville, Pa., in a plot that is under the present church building. (1) This date comes from “Christian Lesnett Genealogy,” by Daniel M. Bennett, page 7. “Daughters of the American Revolution Lineage Book” Vol. 83, page 40, and Vol. 159, page 278, say he was born in 1726. The original source of this information is unknown in each case. Some of this account follows Bennett’s 1931 Lesnett genealogy, which relied heavily on family sources that appear to be unavailable today. An additional source that confirms some of the basic information in Bennett’s genealogy is the account of a 1912 Lesnett reunion, which was held in South Fayette Township, Pa. This was obviously transcribed from a contemporary newspaper but I have not yet located the original version. The transcription is available on the Internet at: ftp://ftp.rootsweb.com/pub/usgenweb/pa/allegheny/history/family/lesn0001.txt The account mentions that D.M. Bennett was elected vice president of the family’s “officers” so it’s no surprise that the two sources would agree on most points. (2) Children – except Christian Jr. – are listed in Christian’s will in Allegheny County Will Book 1, page 253. The will is cited in “Will Abstracts of Allegheny County, Pennsylvania, Will Books I through V,” compiled by Helen L. Harriss, pages 18 and 19, and is transcribed in “Christian Lesnett Genealogy,” page 17. Christian Jr. is listed in a court case in “Virginia Court Records in Southwestern Pennsylvania; Records of the District of West Augusta and Ohio and Yohogania Counties, Virginia, 1775-1780,” by Boyd Crumrine, page 248. The names of the daughters’ husbands come from administration papers from Allegheny County Account Book 7, Page 114, which are transcribed in the Lesnett genealogy. (The transcriptions in the genealogy are reliable although the spelling and capitalization has been standardized in some cases.) That of Rowley is confirmed in “Pittsburgh, Pa., Gazette Genealogical Gleanings 1786-1820, Vol. I,” by Mark H. Welchley, page 59. The husbands of Christianna and Sophia, and the wife of Francis – Rachel Kitten – are mentioned in Francis’ Revolutionary War Pension application – 22.661. The application also mentions the birth dates of Francis and Christianna. These dates don’t agree with the date provided in secondary sources. (3) Their arrival in America was in 1745, according to “A Genealogical and Biographical History of Allegheny County, Pennsylvnaia.,” by A. Warner & Co., page 484. This account was published in 1889 and could represent a clearer recollection of the events than the genealogy, which was published 42 years later. Although Nancy isn’t mentioned in the will abstract, Christian’s will lists Nancy Vance as an heir. Administration papers from Allegheny County Account Book 7, Page 114, are transcribed in the Lesnett genealogy and they indicate that Nancy was the wife of John Vance. (4) The 1931 genealogy says they wed in 1757. “Daughters of the American Revolution Lineage Book,” Vol. 83, says the marriage was in 1751. Vol. 159 of the “Lineage Book” says it was in 1747. The source of the information in both of these books is unknown. “A Genealogical and Biographical History of Allegheny County” says “about 1752.” (5) “The Battle of Bushy Run,” by C.M. Bomberger. (6) The genealogy mentions Gillion. Richard Gilson comes from “A Genealogical and Biographical History of Allegheny County, Pa.” A George Gilson lived near Christian in 1790, according to that year’s U.S. census. (7) “A Genealogical and Biographical History of Allegheny County, Pa.,” pages 61 to 74. (8) “Records of the District of West Augusta, Ohio County and Yohogania County, Va.,” by Richard Loveless, page 248. (9) “Pennsylvania Archives,” Series 3, Vol. 26,page 576. (10) “Pittsburgh Gazette Abstracts, 1797-1803,” compiled by Clara E. Duer, page 14. (11) “Early History of The Peters Creek Valley and the Early Settlers,” compiled by Noah Thompson, page 57. (12) “A Genealogical and Biographical History of Allegheny County, Pa.,” page 22. “History of Allegheny County, Pennsylvania,” by Samuel W. Durant, page 151. (13) “Virginia Court Records in Southwestern Pennsylvania; Records of the District of West Augusta and Ohio and Yohogania Counties, Virginia, 1775-1780,” by Boyd Crumrine. The first case is on page 248 and the second is on page 327. (14) The petition is recorded in “Frontier Retreat on the Upper Ohio, 1779-1781,” by Louise Phelps Kellogg, pages 363-370. The general outline of the dispute and its impact comes from “The Indian Wars of Pennsylvania,” pages 860-861, and “Fort McIntosh: Its Times and Men,” by Daniel Agnew, page 25. This book was written in 1893. (15) “The Indian Wars of Pennsylvania,” by C. Hale Sipe. (16) The Daughters of the American Revolution Lineage Books cite service in Capt. Stockley’s company from 1778 to 1783 in Vol. 83, page 40, and in Capt. Charles Bilderback’s company in Vol. 159, page 278. However, these older DAR volumes are known to contain errors. I have been unable to locate a muster roll showing service in Stockley’s company. The only mention I could find for Bilderback’s company says “Christy Lisnet,” which probably indicates Christopher or perhaps the younger Christian, though that would seem unlikely since he would have been only 13 or so at the time. This reference is in “Pennsylvania Archives” Series 6, Vol. 2, page 389. The name “Christian Lesnit” appears in Capt. Reed’s company on the same expedition and this reference is probably for the father. (17) Service with Swearingen is in “Pennsylvania Archives” Series 6, Vol. 2, page 94, and service with Reed is in the same volume on page 398. (18) “The Indian Wars of Pennsylvania,” page 728. (19) “A History of Northwestern Ohio,” by Nevin O. Winter, pages 29 to 42. (20) “Indian Wars of Pennsylvania,” pages 710 to 715. (21) “Washington County Pennsylvania Tax Lists,” compiled by Raymond Martin Bell and Katherine K. Zinsser, page 29. (22) “The People and Times of Western Pennsylvania,” Special Publication No. 5 of the Western Pennsylvania Genealogical Society, compiled by Clara E. Duer, page 12. (23) “DAR Lineage Book” Vols. 83 and 159 list his year of death as 1804. However, the will is dated June 27, 1806 and proved on Oct. 10, 1807, according to the will abstracts. John, born Feb. 29, 1800. Margaret, born Oct. 14, 1803. Married Robert Christy. Nancy, born 1805. Married Dell Weaver. Elizabeth, born 1813. Married Thomas Weaver. Francis, born May 18, 1815. Arabella, born 1820. Married John Ramsey. In 1769, according to the genealogy, Christian Lesnett staked a claim on land in western Pennsylvania. He traveled west with his two eldest sons – Frederick and Francis – and a neighbor named Gillion, or Gilson. (5) They built a cabin, cleared some land and planted rye, turnips and corn. In the fall, the men left the two boys to hold the claim, and returned to Hagerstown, Md. They expected to return with the remaining family members before winter set in, but Christian was detained as a witness in a lawsuit. The snow came early and deep in the mountains, so they were unable to return until the following April. The two boys spent the long winter alone. They had to hunt and fish for their food. They saw no other people. On account of this hardship, Frederick suffered from rheumatism the rest of this life. A few years later, according to the genealogy, Frederick and a number of men started down Chartiers Creek from Canonsburg, taking a boatload of flour to New Orleans. While polling down the Ohio River, they saw wild turkey along the bank at a bend near Wellsburg. Frederick and another man got out and started after them. While thus engaged, they heard the danger signal from the boat, warning them of Indians. They turned their canoe and headed back to the boat when the Indians opened fire. One of the bullets penetrated the canoe and struck Frederick in the calf, pressing the buckskin legging far into the flesh, making a painful and dangerous wound. None of the rest were hurt. When they reached Wheeling, they took Frederick ashore. He soon recovered and returned home afoot. The others continued down the river, but never returned because they were killed by the Spaniards, who controlled Louisiana. Some years later, when the United States bought Louisiana, a bounty was paid to the men’s survivors for the lost lives and the flour. The activation of units from the 4th Battalion followed a series of Indian raids that killed and captured a number of settlers in the Pittsburgh area. There is nothing on the pages of “Pennsylvania Archive” to indicate that this was anything other than a typical militia rendezvous intended to pursue raiders. However, several researchers have suggested that these units were among those that ended up committing one of the greatest atrocities of the war in the West. The date of March 1 corresponds with the time Col. David Williamson set out on an expedition that ended up slaughtering about 100 peaceful Delaware Indians who had converted to Christianity. (7) Despite the timing, there is no proof that the Lesnetts participated in the attack on the Delawares. In fact, it seems unlikely. First, the attackers quickly realized the nature of their deed and initiated a sort of cover-up to prevent prosecution. As a result, the attacker failed to submit a roster of participants. That would seem to indicate that rosters that were submitted were for units that performed legitimate service on the frontier in the wake of the initial attacks. In addition, the editors of “Pennsylvania Archives” compiled a list of suspected participants and the Lesnetts don’t appear on it. In 1796, Frederick married Isabell Wilson, according to the Lesnett genealogy. The papers from Frederick’s estate show a relatively successful farmer, with a good deal more livestock than many farmers in the region had at that time. Among the possessions listed in the inventory were three mares, a colt, five cows, two steers, a yoke of oxen, a small ox, two calves, eight first-choice sheep, 12 other sheep, five lambs, a sow with four pigs, 24 hogs, “1 Lot” of chickens, geese, turkeys and ducks, bees, much grain and assorted farming implements. Frederick died April 6, 1830. Both Frederick and Isabell are buried in Bethany Presbyterian Church Cemetery at the mouth of Miller Run, near Bridgeville, Pa.
Nancy Jane, born about 1826. Married a Brown. Dell W., born March 18, 1831. Robert C., born about 1836. Mary Emeline. Married a man named McIlrain. In the 1830 Census, Christian Lesnet is listed in North Sewickley Township, Beaver County, Pa. His household contained one male age 30-39, one female under 5, two females 5-9, one female 10-14 and one female 20-29. In the 1850 Census, Christy Lisnet appears in the Perry Township, Lawrence County. He was a farmer who owned real estate valued at $3,500. His household contained his wife Margaret; Nancy, age 24; Elizabeth, 22; Delweaver, 19; Sarah, 16; Robert, 14; and Mary, 11. In the 1860 Census, Chris. Listnett, is listed as a farmer in Franklin Township, Beaver County. He owned real estate valued at $5,500 and personal property $700. His household contained his wife Margt. and Mary, age 21. The 1931 genealogy of the Lesnett family gives the following account of the lifestyle of early Americans. It comes from an item on Christy’s sister, Elizabeth, but is applicable to all those of the time. Like all early settlers, the Lesnetts had to depend upon primitive ways of getting along. All farmers in those days made their own soap, but lye was essential to soaponify the grease. To procure this, wood ashes were collected in a barrel. Small holes were drilled in the bottom and water poured in. The water would filter through the ashes and gather in a vessel below. This was the lye. They used bark from a sassafras tree to perfume the soap. (1) Christy is named in his father’s will in Allegheny County, Pa., Will Book 3, Page 406, which is cited in “Will Abstracts of Allegheny County, Pennsylvania, Will Books I through V,” compiled by Helen L. Harriss, page 77. Birth dates comes from “Lawrence County Cemeteries: Book 8: Perry and Washington Townships,” compiled by Dwight E. Copper, page 15. (2) Margaret’s father is identified in Beaver County Will Book B, page 128. Her approximate birth year comes from “Lawrence County Cemeteries,” which says she was 83 when she died in 1883. That agrees with the 1850 Census of Perry Township, Lawrence County, Pa. (3) Christy’s children are identified in his will in Lawrence County, Pa., Testamentary File L, No. 21. 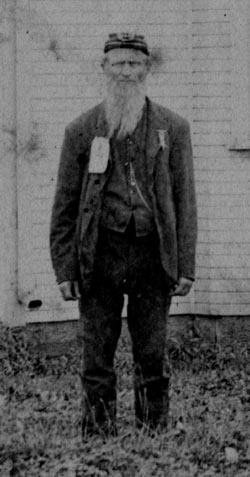 Dell’s birth date comes from his Civil War pension file – Invalid Pension 948910 and Revised Certificate Number 798.263. The other children’s birth years come from the 1850 Census of Perry Township, Lawrence County. Mary Emeline is probably the Mary listed as 11 in the 1850 Census. (4) The 1835 purchase is mentioned in Beaver County Deed Book, 24, page 121, which records the sale of 3 acres in 1844. The 1845 purchase is mentioned in Beaver County Deed Book 163, page 367, which records the tract’s later sale by Christy’s son Dell to George W. Bowers. The rest of the information in the paragraph is recorded in Christy’s will. (5) “Tax Records 1841-1850 Beaver County, Pennsylvania,” by Helen G. Clear and Mae. H. Winne, page 3. (6) “Christian Lesnett Genealogy,” by Daniel M. Bennett, pages 30 and 31. 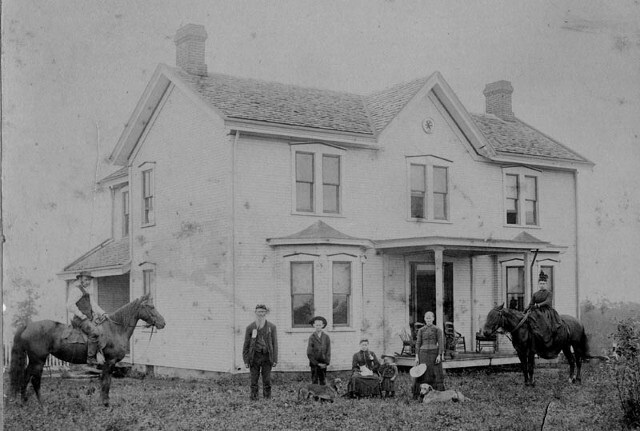 Dell W. Lesnett farmhouse in Franklin Township, Beaver County, Pa., about 1890. Permilla, born Feb. 14, 1859. Married George W. Bowers, and later Ernest Wehman. 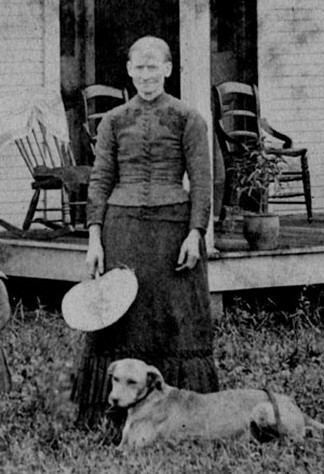 Olive Jane, born about April 1870. John B., born Nov. 13, 1873. The 1860 Census lists D.W. Listnett as a farmer in Franklin Township, Beaver County, Pa. He owned real estate valued at $2,2,50 and personal property valued at $675. His household contained his wife Emeline and Permilia, age 1..
During the Civil War, Dell was served in Company G of the 168th Pennsylvania Drafted Militia Infantry Regiment from Oct. 16, 1862 to July 24, 1863. (4) This nine- month unit never faced the enemy. “History of Pennsylvania Volunteers” records the brief history of the 168th Regiment: “This regiment was raised in the counties of Westmoreland, Fayette, Greene, Beaver, Allegheny, and Erie. The men rendezvoused at Camp Howe, near Pittsburgh, during the latter part of October, 1862, where the companies were organized, and the following field officers were chosen: Joseph Jack, of Westmoreland county, Colonel; John Murphy, of Washington county, Lieutenant Colonel; John J. Cree, of Fayette county, Major. Clothing, arms, and accoutrements, and the State colors, were received on the 2d of December, and on the evening of he same day, the regiment started for the front. “Upon its arrival at Fortress Monroe, it was ordered to Newport News, where it remained some two weeks, with the command of General Corcorn. It was thence ordered to Suffolk, Virginia, and was there assigned to Spinola’s Brigade, subsequently known as the Keystone Brigade. From Suffolk, the brigade was ordered to Newbern, North Carolina, whither it proceeded by way of the Chowan River, arriving on the 1st of January, 1863. The regiment was here thoroughly drilled, and the officers instructed in the duties. It was out upon several expeditions against the enemy, but did not come to battle. Soon after the retreat of the enemy under General Hill from before Little Washington, which he had been closely besieging, the Keystone Brigade was ordered thither to relieve the garrison. Here it remained until the 28th of June, when it was sent to Fortress Monroe, and thence to White House, to cooperate with forces under General Dix, in a demonstration towards Richmond. Although he never saw a major battle, Dell seems to have been proud of his service in the war. In a photograph taken at least 30 years later, a long-bearded Dell can be seen wearing his soldier’s cap. In the 1870 Census, Dell Lesnet is listed as a farmer in Franklin Township. He owned real estate valued at $6,000 and personal property valued at $1,000. His household contained his wife Emaline, Permella, age 11, and Olive J., 4 months. In the late 1870s, the family moved to Caroline County, Md. When his daughter Permilla married George W. Bower, in December 1879, she is listed as a resident of Caroline County. The county’s grantee index shows that Dell W. Lesnett purchased land from Richard C. Carter in 1880. (7a) In the 1880 Census, Dell W. Lesnett is listed as a farmer in the Greensboro District No. 2 in Caroline County. His household contained Emeline, Olive, 10, daughter; John, 6, son; and Joseph Morton, 30 cousin. Before 1890, the family moved back to Franklin Township because Dell W. Lessnett is listed in that year’s special schedule of Civil War veterans. It records his service in the 168th Pennsylvania. The pension file also provides some physical description of Dell. He was 5 feet, 8 1/2 inches tall and weighed 157 pounds. He had blue eyes a light complexion and light hair (although he was old by this time and the notation may simply indicate it was gray). On March 17, 1898, Dell sold his 105-acre farm in Franklin Township to his daughter Permilla and her husband George Bower for $1,300. The 1900 Census of Franklin Township lists Dell Lesnett as a farmer. In addition to his wife Emeline, his household included Olive J., daughter; John B., son; Hosia, 6-month-old grandson; and John Greib, a 15-year-old boarder and day laborer. Early the next year, Dell apparently sold rights to a local oil and gas company to drill for gas on his property. On Feb. 10, 1916, the New Castle News reported: “With bits eating into the earth more than 300 feet from the surface, the local officials of the Ellwood City Oil and Gas Co. are anxiously awaiting developments in the first ‘wild cat’ well for oil or gas drilled in this vicinity. Prospects are bright for a flow of gas or oil. “The ‘wild cat’ well of the company is situated on the D.W. Lesnett farm south of this city and is about 1,000 feet from the big gas well now owned by the American Gas company. It is believed that the local company will be successful in their search for oil. It seems likely that the gas deal is responsible for later family accounts of the Lesnett family being relatively wealthy. In his will, he left the bulk of his estate to John, Olive and Olive’s son, Hosea. (10) John and Olive are listed as living “at home” in Dell’s death notice. Hosea was born in December 1899 and was the son of George Bower. (11) The 1920 Census lists the 20-year-old Hosea as the head of the household containing John, his uncle, and Olive, his mother. Olive is listed as single, although the census taker initially marked her as married. They lived in Franklin Township beside Charles Bowers, the son of George and Permilla. During the 1930s, Hosea moved to Washington State with his half-brother Dell Bower, another son of George and Permilla’s. Olive spent her later years in the Almira Home for Elderly Ladies in New Castle, Pa. She is mentioned as a resident of the home in articles appearing in the New Castle News June 20, 1939, and Oct. 26, 1948. Dell and Emeline are buried at the English Lutheran cemetery in Zelienople, Pa.
(1) Dell’s date and place of birth come from his Civil War pension file – Invalid Pension 948910 and Revised Certificate Number 798.263. Dell is named as Christopher’s son in his will in Lawrence County, Pa., Testamentary File L, No. 21. Del’s middle name was probably Weaver. The 1850 Census lists as “Delweaver,” age 19, among Christopher’s children. (2) Except for Olive, the names and dates come from Dell’s pension file. The pension file says Olive was born June 21, 1870. However, Olive was listed as 4 months old when the 1870 Census was taken on June 8. (2a) Beaver County, Pa., File No. 7 from December 1917 term and No. 180 of the March 1921 term. (2b) Ellwood City Ledger, 50-years-ago item from May 16, 1973. (3) Marriage information and maiden name come from Dell’s pension file. Margaret’s parents are listed in the 1850 Census for Franklin Township, Beaver County, Pa. Her birth date is from the listing for the English Lutheran cemetery in Zelienople in “Butler County Cemetery Inventory, Vol. 4,” page 18. Her birth place comes from the 1900 Census, Beaver County, Pa. (4) Franklin Township, Beaver County, Pa., 1890 Census. Bates’ “History of Pennsylvania Volunteers” mistakenly lists him under Company F. He is listed in Bates and in the National Archives as “Dell W. Lesmith,” but his pension is filed under the correct spelling. (5) “History of Pennsylvania Volunteers 1861 to 1865, Vol. IV,” pages 1134 and 1144. (6) Beaver County Deed Book 163, page 367, mentions the inheritance and the later sale of the farm to George W. Bower. (7) “Caldwell’s Illustrated Combination Centennial Atlas of Beaver County, Pa.” (7a) “Caroline County, Maryland, Marriage Licenses 1865-1886,” compiled by Dorothy H. Baird and Louisa A. Scott, found at Caroline County Library in Denton, Md., page 15. Caroline County, Md., General Index, Grantees, from 1851 to 1885, page 371. (7b) “Eastside Beaver County Tax Records 1890,” by Helen G. Clear and Mae H. Winne, Publishers of Beaver County Records, 1998, page 2. (8) “Butler County Cemetery Inventory.” (9) Date of death comes from Beaver County Register’s Docket 11, page 449, and “Butler County Cemetery Inventory.” Dell’s pension file says he died March 5, 1916. Velma Holfelder in 1990 said his buggy was hit by a car. However, a notice of his death that appears in the New Castle News from March 6, 1916, indicates that he died “following a general breakdown in health due to advanced age.” It is possible that Velma was thinking of another great-grandparent, Sarah Belles, who did die in a buggy accident. (10) Beaver County Will Book T, page 163. (11) Hosea’s approximate birth date appears in the 1900 Census of Franklin Township, Beaver County, Pa. I have not located a birth record but Bowers family tradition indicates that he was the son of George Bower and Olive Lesnett. The 1900 Census lists “Hosia” as Dell’s grandson. The 1910 Census of Franklin Township lists him as the head of the household containing Olive, who is identified as his mother. (12) Beaver County docket for March Term, 1921, page 117. (13) New Castle News of May 18, 1923. Also Ellwood City Ledger, 50-years-ago item from May 16, 1973. Dell W. Lesnett, about 1890. Emeline (Potter) Lesnett, about 1890.